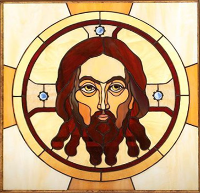 This is the place to find your local stained glass artist and studio. 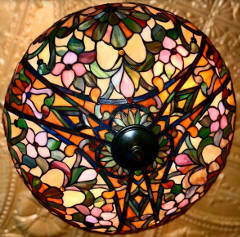 We also talk about stained glass, leaded windows and lights, kiln fired painted glass, fused & hot glass & Tiffany lamps. 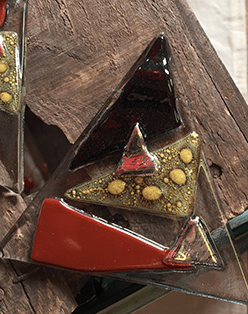 Click HERE to FIND a stained glass STUDIO near you or in your county. And, welcome to our new-look mobile friendly web site. 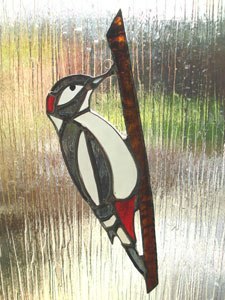 Stained Glass LIGHT-CATCHER of the week! Something simple yet quite lovely. ENTRIES CLOSED ON 4th APRIL! DETAILS: The Competition closed on 4 April 2019. CLAIRE LAKE FUSED GLASS Holmfirth Food and Drink. I found Claire Lake at the Holmfirth Food and Drink festival Sunday 30 Sept.
She likes to make statement pieces like stove flash backs (none on show) but she did bring rather good examples of dishes and this very good Xmas Decoration. Worth the walk down the hill to see her outstanding kiln fused glass. A stunning Hot Glass lamp. The text is short but it appears that this lamp is made by, or is for sale by an Austrian firm. A truly stunnung piece of glass art! 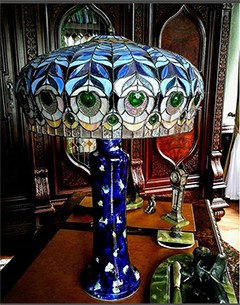 An above average Tiffany ceiling lamp in stained glass. 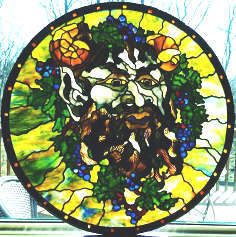 Posted by Cazasikes, this picture in Stained Glass deserves to be the image of the month. It is by one of Cazasike's new artists. I like this portrait made with coloured glass. As far as I can see, there is no painting. All the art work is in the lead lines. E-mail comments welcome. Ed the Editor.